Bishop Alan McGuckian told a packed congregation of almost 1,000 at the requiem Mass of the popular priest that included upwards on 100 priests in the Church of Blessed Virgin Mary, Frosses on a grey autumn day. The bishop said he was a great family man and it “would have taken a strong woman” to laughter in the chapel. “And it would have been wonderful to have been a child or son or daughter of Seamus Gallagher’s,” he said. The bishop said Seamus Gallagher had the talent to succeed at anything in this world. “But he did not choose to have a career that would have made him successful in the eyes of this world. “He chose, in answer to a call from God to be a Catholic priest and to devote his life to it and was faithful to it to the end." The bishop said: “Seamus was not a stereotypical pious priest”. “Seamus was a very talented man and he made playing music seem effortless. “Behind a happy go lucky exterior, he was smart and he was deep and was passionate about so many things”. 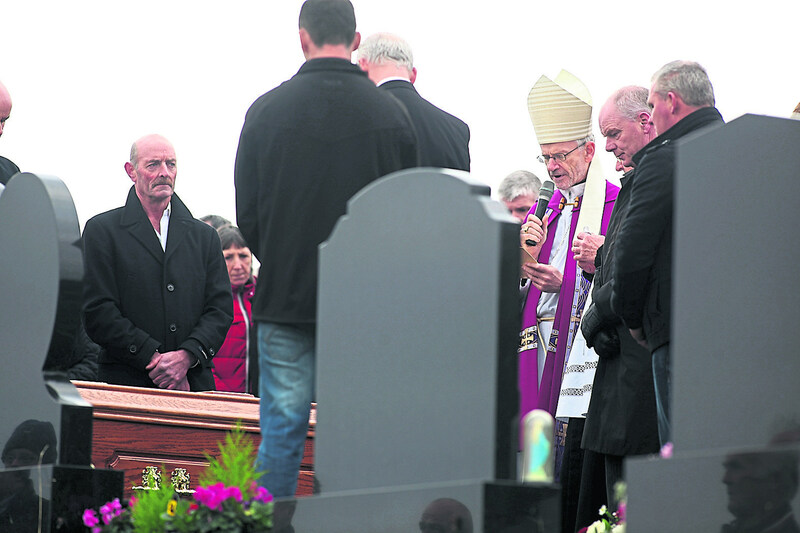 Fr Seamus Gallagher was laid to rest in Ardaghey cemetery.